The two phones we’ll be comparing today have identical prices, run on the same chipset and more importantly, don’t compromise on any aspect. The newly-launched ASUS ZenFone Max Pro M2 (first impressions) is targeted towards folks who want long battery life, whereas the Realme 2 Pro (review) is all about powerful specs and stylish looks. While the former has its price starting at Rs 12,999, the latter’s base model can set you back by Rs 13,999. 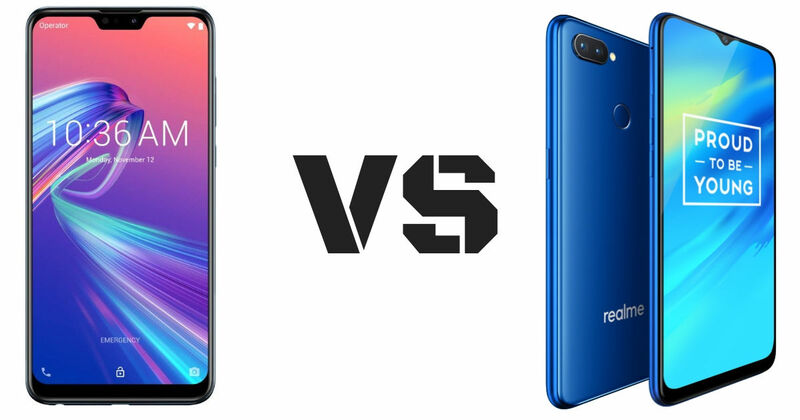 While making your next purchase in the Rs 15k segment, you’ll most probably be torn between these two, which is why we’ll be giving you a detailed comparison between the ZenFone Max Pro M2 and Realme 2 Pro to help you arrive at a decision. If you have a particular despise for the notch, then the Realme 2 Pro is definitely the better phone for you. It’s got a tiny ‘Dewdrop’ notch that houses the front camera, and doesn’t take much away from the full-screen experience of the phone. On the other hand, the ZenFone Max Pro M2 has a more conventional notch that eats into the display quite liberally. The rear surface of this ASUS device is made from glasss that curves towards the sides to add a touch of craftsmanship. As for the Realme 2 Pro, its back surface is made from plastic, although a 15-layer lamination ensures that the surface is glossy enough to make it look like glass. Dual rear cameras and fingerprint scanners are the other occupants of the rear panels of both these phones. Both the phones have bottom-firing speakers, and not surprisingly, both even come with headphone sockets. It’s also worth noting that these devices have been fitted with dedicated microSD card slots that don’t interfere with your dual-SIM usage. Sadly however, these devices continue with micro-USB connectors, instead of the latest Type-C standard. Coming to their displays, the ZenFone Max Pro M2 grabs a 6.26-inch IPS LCD panel with a resolution of 1,080 x 2,280 pixels. As for the Realme 2 Pro, it sports a 6.3-inch screen with a resolution of 1,080 x 2,340 pixels. Both displays come with Gorilla Glass protection, although the ASUS handset features the latest v6, while the Realme phone comes with GG3. Both ASUS and Realme have blessed their offerings with the Snapdragon 660 chipset. This allows them to be powered by a 2GHz octa-core processor and an Adreno 512 GPU. In fact, they are the most affordable phones to come with Qualcomm’s powerful mid-tier SoC. The ZenFone Max Pro M2 is available in three RAM and storage variants of 3GB + 32GB, 4GB + 64GB and 6GB + 64GB. The Realme 2 Pro also offers 64GB storage on its 4GB and 6GB RAM versions, but it has a higher-end 128GB storage model that ships with 8GB of RAM. The user interface of the ASUS ZenFone Max Pro M2 has been kept very stock-like. The fact that it runs Android 8.1 Oreo is kind of a bummer though. A software-based face unlock mode is one of its main highlights, while several AI-based camera enhancements have also been added. The Realme 2 Pro also boots the Android Oreo-based ColorOS 5.2 software which boasts a number of AI-based photography features and even the facial unlock functionality. Split-screen multi-tasking, an improved gaming mode, app shortcuts and gesture navigation are some of the other features. The ASUS ZenFone Max Pro M2’s dual-camera setup includes a 12MP primary snapper and a 5MP depth sensor. The presence of the latter means portrait shots are possible, and then there’s of course stuff like scene recognition, a beauty mode and more. The Realme 2 Pro comes fitted with a 16MP + 2MP setup, which too enables bokeh effects. And just like its rival, this one too comes with scene recognition and other AI-based traits. The front camera of the ASUS phone is a 13MP unit, while that of the Realme 2 Pro is a 16MP one. If battery life is what you’re after, then the ZenFone Max Pro M2 wins by a big margin owing to its 5,000mAh power pack. The 3,500mAh battery of the Realme 2 Pro is quite unimpressive compared to that. 10W fast charging is supported by both these phones. Both these offerings are excellent phones given their low prices. What’s great is that no matter which one you buy, you’ll be getting more than your money’s worth. That said, the ASUS ZenFone Max Pro M2 does come across as a better buy than the Realme 2 Pro owing to its low price, unless of course, you are opting for the higher-end 8GB RAM model of the latter.